The sign in front of jeepneys that ply the route from the corner of EDSA and Ortigas Avenue to different buildings inside Ortigas Center CBD is 'Robinson's Galleria-Ortigas Complex'. The exact location where you can ride this jeep is in front of Galleria Corporate Center, the tall building connected to Robinson's Galleria Mall. Wait for a jeep to pass by at the corner of Galleria Corporate Center. This jeepney passes through the one way service road around Robinson's Galleria Mall from Ortigas Complex to its Terminal along Ortigas Avenue. 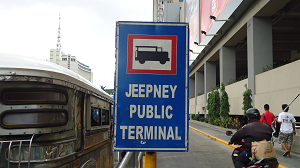 The terminal is a long walk so commuters ride at Galleria Corporate Center and then they transfer to another jeepney at the terminal in going to Ortigas Center Complex. 'Robinson's Galleria-Ortigas Complex' jeepney route is a loop within Ortigas Center CBD that serves passengers from EDSA-Ortigas bus loading and unloading zone. So if you're traveling by bus in EDSA from either north (e.g. Monumento, Cubao, Fairview, Novaliches, Malanday, Valenzuela) or south (e.g. Baclaran, NAIA 1-2-3, Pasay, Alabang, Sucat, Bicutan, Pacita, Muntinlupa, Magallanes, Makati) of Metro Manila, all you need to do is get off the bus at Robinson's Galleria (just make sure you're riding a bus with "Ortigas Ilalim" sign and not "Ortigas Ibabaw") , ride this jeep, transfer to another jeep at the terminal and get off at the area in Ortigas Center Complex near to the building of your destination. Riding a jeep from Galleria Corporate Center in EDSA to its terminal is FREE. Just get off the jeep and get in another jeep located to the front of the terminal. Minimum fare applies. From top-right clockwise: Orient Square, Wynsum Corporate Plaza, Discovery Suites, and JMT Corporate Condominium stand next to each other in this photo of Ortigas Center. Jeepneys with "Robinson's Galleria Ortigas Center Complex" sign passes through their location. Ortigas Station is a long walk from jeepney route going to Ortigas Complex. I presume the time it takes to walk from MRT Ortigas Station to loading area of the jeepney plus the waiting time while the jeepney is being filled up is longer than the time it takes to walk from MRT-3 Ortigas Station to some of the buildings in Ortigas Center Complex. To find out the buildings that are walking distance from MRT-3 Ortigas Station, go to Walking Directions From MRT Station To Ortigas Center Buildings or click here. this is a good advice for may people, thanks for sharing! salamat sa mga comments. kung natutulungan ko kyo sa mga posts ko, pki 'plus one' nlang ako. thanks a lot. This is good! thanks! but I once saw a jeepney with shaw blvd. to ortigas central route. Is it the same jeepney as what you are referring too? Go check it out, click here. @ einej, well, in that case I think you are right sir, naligaw lang. Northern part kasi ng Ortigas ay 'Robinson's Galleria-Ortigas Complex' jeep ang may ruta. You are very welcome. Hi. Do you know how to go to Center point bldg.? near Strata 2000... because I have my job interview tomorrow at this bldg. Thank you. @ Jamie pkibasa po ang buong post dahil nakasulat po ang direksyon sa Centerpoint Bldg. Kung babasahin nyo po ng kumpleto ay mkukuha nyo agad. Salamat po. Thanks! Malaking tulog sya sa akin, ahhahaha 1 week palang ako sa trabaho, lagi ako naglalakad amp ahaha meroon palang jeep. "Ortigas Park faster if you get off the jeep at the corner of F. Ortigas Road and Garnet Road, just before the jeep turn left. 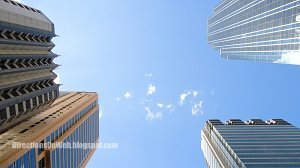 Walk along F. Ortigas west side until you reach Ortigas Park."
? diba mas ok pag bumaba ka sa may strata 2000? Para onting lakad lang? tama ka jan, kung baba ka sa likod ng strata 2000, den tatagos ka papunta sa harap. kung di na kelangan mag iwan ng id sa guard ng strata 2000 mas mabilis talaga ikaw makarating kc konti lakad lang. gosh thank you very much for this info! i was thinking kung pano ako makakapunta sa the taipan place, if i should walk from meralco building at ortigas ave. ba or take this unfamiliar fx ride(tektite). thank you again! @ wellafigueroa, you are welcome, layunin ko po ang makatulong. please help me. paano po pumunta sa meralco compund sa ortigas? from fairview. ano po sasakyan ko signboard ng bus or jeepney papunta sa meralco compund? From fairview sakay po bus na may secondary sign sa harap na "Ortigas Ilalim". Baba po ng Ortigas then ride jeepney with "Rosario" sign along Ortigas Ave near corner EDSA in front of gate of POEA. Ask driver to drop you off at Meralco. It's very near from EDSA. Hi! If I am from MRT Ortigas station, I'm confused if it is easier to walk to Meralco bldg or ride a jeep since I still need to walk from MRT station to the Galleria Corporate Center, right? @ bittersweetrants. It's way too far for a walk from Ortigas Station. Just ride a jeep bound for "Rosario" and ask the driver to drop you off at Meralco Bldg. From Ortigas Station walk your way to Robinson's Galleria or ride a bus with secondary sign that reads "Origas Ilalim" and alight there. Walk to Ortigas Ave side of Robinson's Galleria and ride a jeepney with "Rosario" sign. There's also jeepney terminal under the flyover, just use the pedestrian lane to get there and board the jeepney being filled up. Ask the driver to drop you off at Meralco Bldg. Hope you get the chance to read this reply before you head out. Got it. Thanks a lot, I really appreciate your help. @ arrielle_p. You are welcome. You can also browse other locations. Try reading a guide on our top 10 of the month or the all time favorites. They are on the sidebar. Cheers. How to go in 6H STRATA 100 Bldg. F. Ortigas, Jr. Road (formerly Emerald Avenue) Ortigas Center Pasig City Metro Manila ??? Pls. 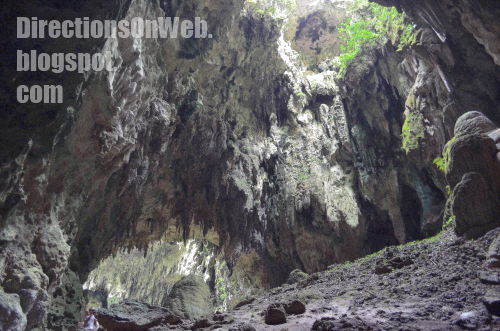 Help me I nid to go there in tomorow morning..
@ Sunjer Galvez. Please follow direction given in this guide and ask driver to drop you off at STRATA 100. Pano po pumunta sa unionbank plaza??? From ortigas station lalakad po ako papunta s rob galleria tpos sakay po ng jeep?? Tama po ba??? Ano po ung signboard ng jeep??? Thanks po!!! @ Joanna Wagas. Pkibasa po muna ang article dahil nakasaad ang kasagutan. Libre po ang info dito. Babasahin nyo lang po. Maraming pong salamat. If from bulacan meycauyan,pano pumunta sa discovery suites?. @ Maevylene Andres. From Bulacan to Discovery Suites, you must ride a FX or bus with terminal located in EDSA. Then take either MRT to Ortigas or bus with "Ortigas Ilalim" sign. Then follow direction given in this article. Thanks. Thank you for this useful info... are the jeepneys plying Robinson's Galleria-Ortigas Complex route there 24hrs? I'll be starting to work on graveyard shift at Discovery suites and need to know my commuting options. Thanks! @ Grace Montañano. You are welcome. When I created this post, the jeepneys were available only till 10 pm. By now that a lot of call center agencies operate inside Ortigas Center, the jeepney operators might have seen the opportunity of operating in 24-hour. But I am not sure about that. May I suggest to please make the inquiry by talking to a driver if you ever happen to commute there around 9 pm? Is there a way from meralco ave to Antel? ayoko pumunta ng terminal kasi lalayo pa ako. I'm thinking of crossing the street and riding a jeep to go there, meron ba? I'm coming from ortigas avenue extension. @ A.M. Ramirez. Just take a jeepney that turns left onto Meralco Ave, alight near Julia Vargas, then walk to Antel. @ Geno Serdan. Pede po Julia Vargas at saka kumanan ng Meralco Ave, madali nyo na mkita ang Metrowalk. Hello po :) Kung liliko po yung jeep ng sapphire pano po papuntang The Medical City? Hindi po to jeep na to sasakyan kundi yun galing Greenhills o yun pila sa ilalim ng Ortigas flyover. Til now po ba may jeep pa rin po na robinson galleria-ortigas complex? ano po ang time? dadaanan nya po ba ang wynsum corporate plaza? There's a jeepney route which is bound for EDSA Crossing that passes through Meralco Ave but takes the flyover so you should just alight before or after the flyover and walk toward the corner of J Vargas Ave.
sir, hanggang ngayon po ba, same route pa rin sila as descibed in this article? salamat po. Please 'About' and 'Legal', thanks. This is very thorough and extremely helpful. Thank you so much!!! You are welcome. Thanks for the appreciation as well.